Baby First Step belonged to my cousin. 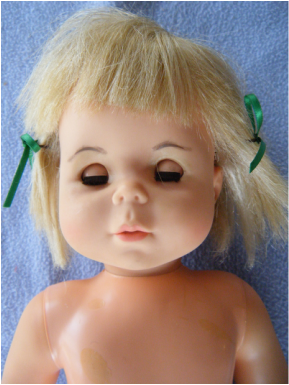 The doll toddles along with a stiff legged gait when switched on. There are several YouTube videos that demonstrate the walking motion. The problem with this doll was that the battery compartment door was hard to install over the batteries; probably due to plastic shrinkage over time. She has some staining (most notably on the arm) and an unusual hole in the back of her head (perhaps part of the manufacturing process?). The clothes were not original except for the socks (which no longer stay up and have yellowed with age). 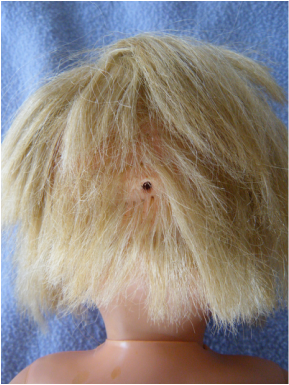 The patent for this doll is very interesting. A motor in the body drives linkages in each leg that move a mechanism in each shoe. The bottom of the shoe is pliable and has a grip pattern that the mechanism moves to make the doll walk. The shoes and socks are integral to the doll. From the looks of the hair, I would guess my cousin attempted some styling when she was younger. The socks are yellowed with age and the elastic that held them up has deteriorated. A good view of the stain on the arm. The most likely source is the dye from the doll's clothing diffusing into the plastic arm. Notice the staining on the right arm and the right leg. 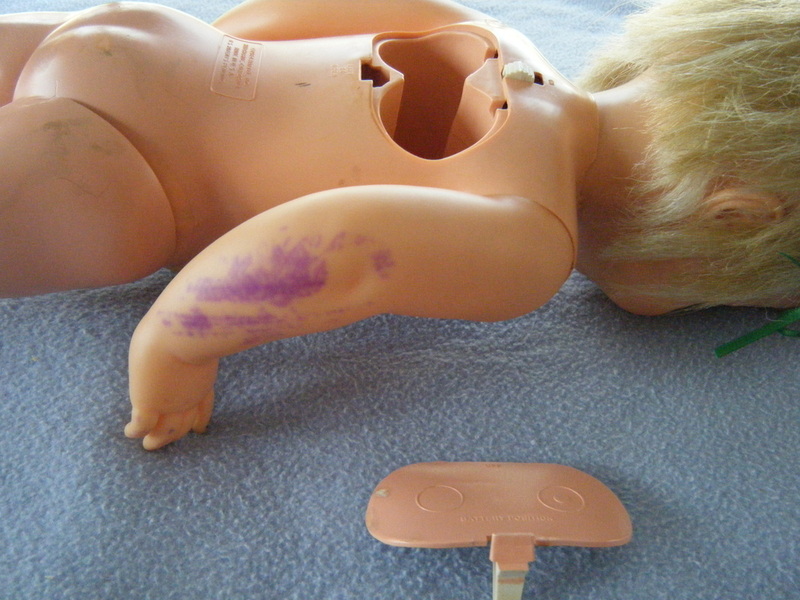 The battery compartment door was very difficult to close - which is why the doll was assumed to not be functional. With a little muscle, the door was closed and the doll came to life. The mysterious hole in the back of the head. It seems likely that it was somehow connected with the manufacturing process. The bottoms of the shoes are soft and treaded. There is a mechanical system, described in the patent, that acts on the shoe bottom to propel the doll forward. It looks like my cousin wrote something in ink on the bottom of the shoe.